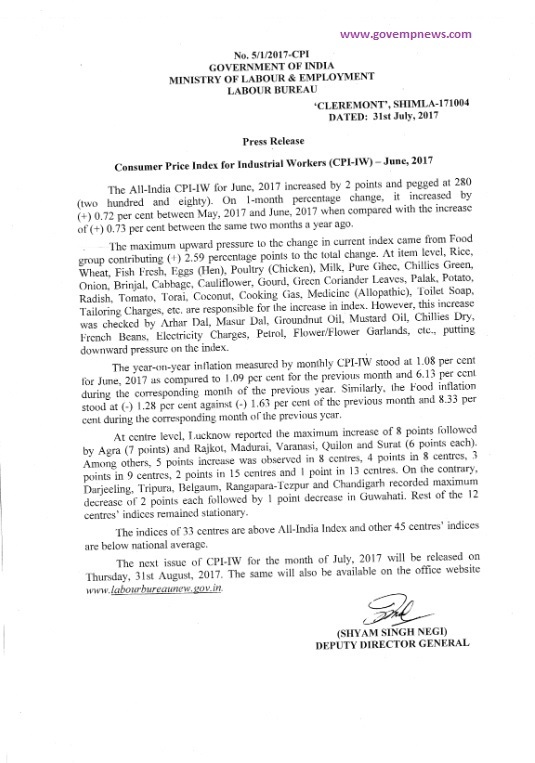 The All-India CPI-IW for June, 2017 increased by 2 points and pegged at 280 (two hundred and eighty). On 1-month percentage change, it increased by (+) 0.72 per cent between May, 2017 and June, 2017 when compared with the increase of (+) 0.73 per cent between the same two months a year ago. The maximum upward pressure to the change in current index came from Food group contributing (+) 2.59 percentage points to the total change. At item level, Rice, Wheat, Fish Fresh, Eggs (Hen), Poultry (Chicken), Milk, Pure Ghee, Chillies Green, Onion, Brinjal, Cabbage, Cauliflower, Gourd, Green Coriander Leaves, Palak, Potato, Radish, Tomato, Torai, Coconut, Cooking Gas, Medicine (Allopathic), Toilet Soap, Tailoring Charges, etc. are responsible for the increase in index. However, this increase was checked by Arhar Dal, Masur Dal, Groundnut Oil, Mustard Oil, Chillies Dry, French Beans, Electricity Charges, Petrol, Flower/Flower Garlands, etc., putting downward pressure on the index. 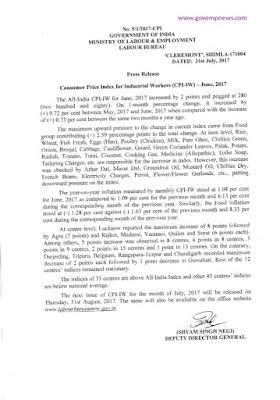 The year-on-year inflation measured by monthly CPI-IW stood at 1.08 per cent for June, 2017 as compared to 1.09 per cent for the previous month and 6.13 per cent during the corresponding month of the previous year. Similarly, the Food inflation stood at (-) 1.28 per cent against (-) 1.63 per cent of the previous month and 8.33 per cent during the corresponding month of the previous year. 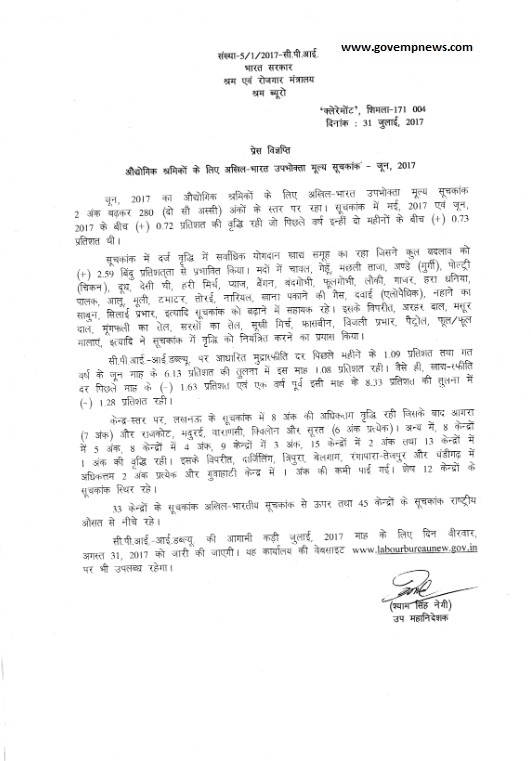 At centre level, Lucknow reported the maximum increase of 8 points followed by Agra (7 points) and Rajkot, Madurai, Varanasi, Quilon and Surat (6 points each). Among others, 5 points increase was observed in 8 centres, 4 points in 8 centres, 3 points in 9 centres, 2 points in 15 centres and 1 point in 13 centres. On the contrary, Darjeeling, Tripura, Belgaum, Rangapara-Tezpur and Chandigarh recorded maximum decrease of 2 points each followed by 1 point decrease in Guwahati. Rest of the 12 centres’ indices remained stationary. The indices of 33 centres are above All-India Index and other 45 centres’ indices are below national average. The next issue of CPI-IW for the month of July, 2017 will be released on Thursday, 31st August, 2017. The same will also be available on the office website www.labourbureaunew.gov.in.